What a 48 hours it’s been! Two days ago, I received an email that my little blog had been chosen (out of 1,029, 431 entries published that day) to appear on Freshly Pressed on the WordPress.com home page. I felt like I had just won the lottery. I called my husband, my sister, my mom. I posted to Facebook and LinkedIn. I walked around with a goofy grin on my face. I was on cloud 9. And then, another feeling — just a twinge of a feeling, really — began to poke its little head out: fear. Is my blog ready for this? Am I ready for this?? Am I really getting recognized for an entry with “turd” in the title??? At 11:00 that evening, ready or not, my account started pinging wildly with new messages. And sure enough, my blog was right there in the first spot on Freshly Pressed. That’s right: I’m the dork who took a picture of the screen with her phone. I spent nearly all the next day poring over my site, responding to emails, moderating comments and basking in the glow of it all. But throughout the entire experience, here is what struck me the most: every comment left — every single one — was positive and supportive. Many years ago, when blogging first came on the scene, I recall thinking, why would anyone want to do that? I saw blogs as little more than personal diaries made public and, for the life of me, I couldn’t understand why anyone would want to shout their most intimate thoughts and feelings to the world. I guess this experience has answered that question pretty definitively. Some time ago, one of my 10 roommates from college emailed this blog entry to the entire group of us, knowing it would make us laugh. It did (in fact, it still makes me snort with laughter each time I read it), and it also started a round-robin flurry of emails amongst the group. I laughed all the way through that afternoon — just like old times. Back in college, we all would sit on the front porch of the old, decrepit house we shared and while away hours we should have been spending in the library. I miss those times, and I miss seeing more of those women. But that day, it was like we were all together again. I remember thinking, this is why blogging is awesome. Blogging connects us to one another. It allows us to share our experiences in an increasingly disconnected society. It allows us to read something that resonates with us, and share a laugh with friends — new and old. Over the past couple days, I have been positively flabbergasted by the number of people who have visited my blog and shared words of solidarity and friendship. I feel like I’ve just done a backwards faith fall into a sea of arms right there to catch me. For all its positives, being a stay-at-home mom can be a lonely job. There are no work lunches, no office holiday parties, no Starbucks runs with the team. Granted, there are mom’s groups and play groups and PTAs, but there are always those solitary afternoons when you’ve been bitten and pinched and spit up on, and you wish desperately for an adult conversation over a glass of wine. So I owe you all a thank you. Thank you for being my confidant, my support system, my outlet. Thank you for reading what I have to say, and making it worth saying. Thank you for traveling this parenting road before me and leaving crumbs of wisdom along the way. Thank you for being there to catch me. Posted in Blogging, Children, Life, Parenting, Pregnancy, Writing and tagged Freshly Pressed, support for stay-at-home-moms, why blogs are awesome, why write a blog. Bookmark the permalink. On the day I was FPed, I had no idea such a thing even existed. I’d only been blogging for a couple of months, and when I opened my email and found hundreds of messages I was befuddled as to what the hell was going on. Then the email notices kept coming. And coming. (My blog was averaging about 50 views a day. On that single day, I got almost 13,000 hits.) When I finally figured it out, it was indeed very much like winning the lottery. Anyway, very, very hearty congratulations on being FPed. The only problem now, I’ve found, is that you pine to have it happen again. With a bit of luck, and some good writing, who knows? Congratulations, what a lofty honor! You story is an inspiration and it speaks to many stay-at-home moms. Blogging truly does provide a sense of community for the lone ranger mom. It encourages us to open up and live. You have very neatly summed up the importance and delight in blogging for stay-at-home moms. When I am unable to make it to church Bible studies, moms’ nights out, or special events with my husband for his job, it is comforting to have others just a keyboard click away in the same boat. I look forward to reading more of what you write–just keep writing as life happens!! Blessings to you. First of all, congrats! Second, I was the same way about blogging initially. And then one day, I realized they were great. Not only would I get to write, I’d get to receive feedback on that writing… and make human connections in the process. In a word, awesomesauce. Your FP post was lovely and encouraging, and I’m glad you got the publicity because now I know your blog exists! Blogging has been a tremendous boon to me too; sometimes it’s what gets me through the day when I have nothing on the near horizon to look forward to. Its more than just a hobby or a diary. It’s a way to connect and forge new relationships with people I would otherwise never encounter. I guess you were ready, after all, weren’t you? Is congrats an appropriate word? 🙂 YAY! Congratulations! I’m new to blogging on wordpress having only blogged on Sparkpeople until now. Can’t say that I have alot in common with you, other then the comment you made about being confined alot to the home as a mommy. I have to begin blogging about all the foilables of taking care of a 91 yr. old bedfast mother-in-law with Dementia. Since I’m elbow deep in doo doo most days, I couldn’t help but be drawn to the title of your blog. Maybe one day, I will get to be freshly pressed. For now, I just want to figure it all out. Wow! I shared that attitude you describe for so long – what can possibly be the appeal of a blog about my experiences, for anyone else? And also, where do people with actual lives to live find the time? I just started a month ago at last, and am sucked in now. It’s a fun world of words and truth and humor. Glad you were pressed so I could find you! I think we would be friends if we met in a playgroup! I have a son who was born in August 2011, and he has the same sweet temperament. Congratulations on Hudson, and being freshly pressed! Congratulations! 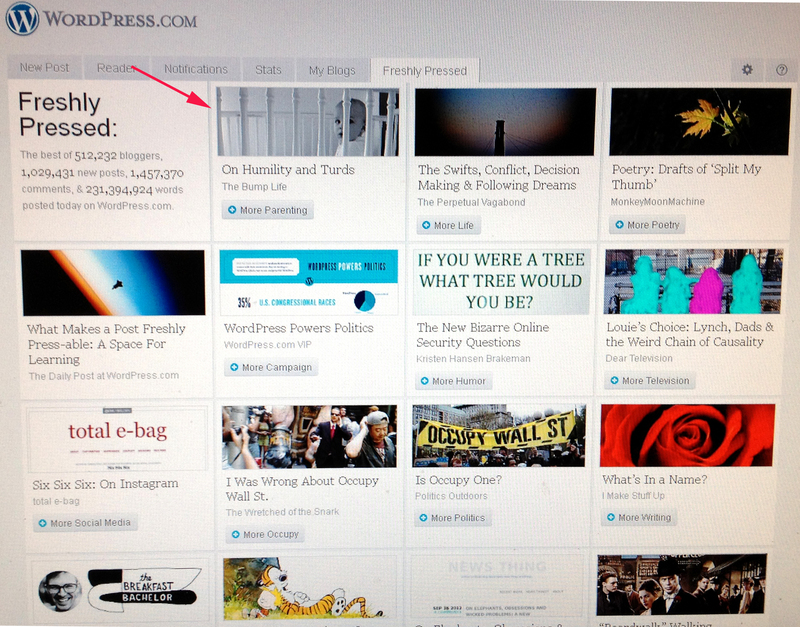 Your blog is awesome and I am really happy to have “discovered” you on Freshly Pressed. You deserve to be featured and I look forward to reading more of your blog.